As you all probably know recently Mac debuted the Iris Apfel collection, well online it sold out within a few hours, and unfortunately the mac counter I go to wasn't selling it so I didn't get my hands on them. WELL the other day I did come across these gorgeous wet n wild babies at a local drug store from their new spring collection and immediately I died because they look SO CLOSE to Mac's collection. As you know wet n wild is super inexpensive brand, that sells really great quality product. The price of these were under 2 bucks. If I got the mac well we all know I would have spent $50 easily on three. Don't Blink Pink is a gorgeous dark magenta color, very vibrant and super bold. Dollhouse pink is a very light pale soft pink color that is probably one of my favorites. The color is very bright. Pinkerbell is a flamingo pink color. Also very bright and super pigmented. 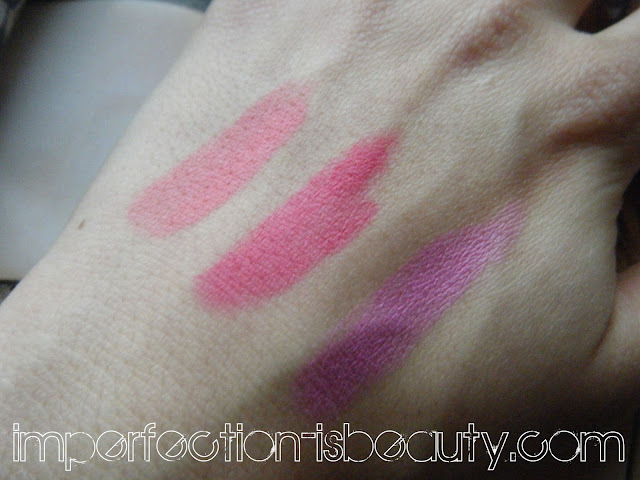 Overall the lipsticks aren't that moisturizing, and the formulas aren't the greatest. Each are very pigmented, and very gorgeous in color. I did apply a balm before so they wouldn't be as drying and the color pay off is still pretty great. These are wonderful for spring to add a pop of color to spice up your daily makeup regimen. I usually would rather wear a brighter lip then a brighter eyeshadow. The price of these are great, and easy accessible. These are limited edition so I'm not sure how long these will be out or how often they will be restocked so I do suggest if you see these babies snag them up while you can. I'm not sure what other colors they have in this collection. I did see a orange color but it was opened so didn't get to pick that one up. As far as lasing power I wouldn't say these are the greatest thing. Majority of the time you pay for what you buy. I did get them to last a little longer the more frequent I put on a balm or a gloss over top to prevent it from drying out. Will you be wearing this bright lip trend for spring? I love those colors! And the packaging is pretty nice too for being a cheap(er) brand! :) Does the color last for a while? Or does it wear off pretty quickly? I was not able to get any of the Iris Apfel lipsticks either not that I was crazy about spending that much money neway so this is a great alternative. I really like the dollhouse color. I'll have to go find it. Thanks! Wow!! Beautiful colors. I gotta try these out soon. I love these lipsticks! I have quite a few, I couldn't believe the quality was so good. I haven't seen anyone really blog about them. Awesome post. I've never seen these around but I'm going to keep an eye out for it! I really like the Dollhouse shade. omg they're so gorgeous. I hope i find them at my local drugstore! Great colors and so affordable babe. Good news is that these will be part of the permanent line, so it's just a matter of patience before the rest of us will be able to find these! The whole collection is set to be released next month. to be a great author. I will make certain to bookmark your blog and definitely will come back in the foreseeable future. Greetings, I do believe your website may be having web browser compatibility issues. Whenever I look at your website in Safari, it looks fine however, if opening in Internet Explorer, it has some overlapping issues. Quality posts is the key to attract the viewers to go to see the website, that's what this web site is providing. higher! Come on over and discuss with my site . Hi! I could have sworn I've been to this blog before but after looking at a few of the posts I realized it's new to me. trick. Furthermore, The contents are masterpiece. you've done a magnificent task on this topic! Your method of describing the whole thing in this post is genuinely pleasant, all can simply be aware of it, Thanks a lot. a while and yours is the greatest I've discovered till now. But, what about the bottom line? Are you certain concerning the supply? and in my opinion recommend to my friends. I'm sure they'll be benefited from this web site. Have a look at my blog ... just click the next web site - chatclimax.